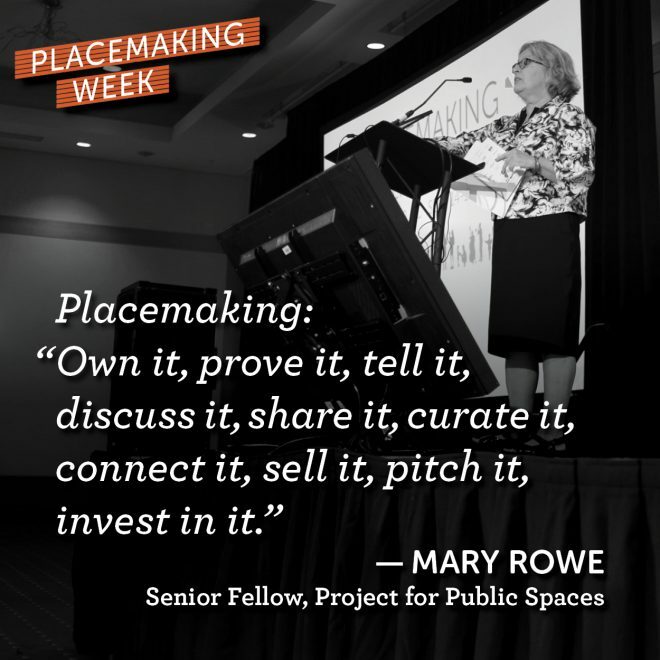 At the Placemaking Leadership Forum this fall, more than 450 dedicated public space practitioners and policymakers came together to chart the future of the placemaking movement. The second day of the event was structured around ten major issues that converge in public space, which we at PPS refer to as "transformative agendas." 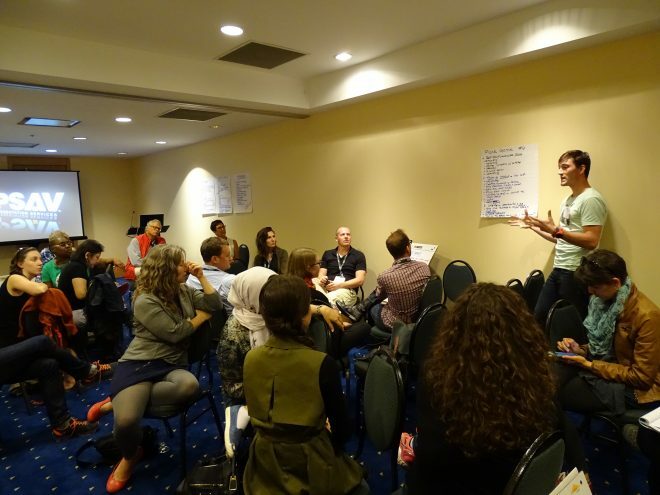 Attendees broke into six breakout groups to discuss new research and strategies, and to identify areas where placemaking can have the greatest impact. Exploring the themes of Place Governance, Transportation and Streets as Places, Arts-Based Placemaking, Innovation and Entrepreneurship, Healthy Communities, and Rural Placemaking, these sessions followed a variety of formats, from presentations and discussions to in-depth working strategy meetings. After marking up stacks of flip charts and post-it notes, representatives from each breakout reported back to the entire group. This blog post synthesizes the live-scribed notes from those breakouts, laying out priorities for each transformative agenda. At the Placemaking Leadership Forum, rural placemaking reported out last, but PPS’s Cynthia Nikitin began her summary by saying that one day soon rural placemaking would come first, not last, on the agenda—and here we are. Indeed, to ignore rural places is to ignore over 46 million people in the U.S., about 15% of our population. These communities face a unique set of challenges that demand a proportionate amount of our attention. While many rural communities have a strong sense of place, they often lack the infrastructure, investment, resources, and specific kinds of local expertise necessary to thrive. Today’s rural communities face ongoing population loss, especially among young people, loss of employment opportunities, or even the loss of entire sectors and institutions. Along with this, rural communities are also deeply affected by macro issues like climate change and demographic shifts. While residents of these places may sometimes be reluctant to change, these trends demand an active, forward-looking response. To address these challenges, attendees agreed that rural communities need a more robust toolkit, including shareable presentation slides, sample legislation, benchmarks, webinars, trainings, and how-tos—all building on the work of the Citizens’ Institute on Rural Design™. One particularly interesting opportunity lies in guides to federal programs and funding. While much funding is available at the federal level, complex bureaucracy often stands in the way of accessing it. Training and translation services for rural communities on this topic are vital. But creating these resources is only one side of the equation; the other involves curating and organizing them in a way that is most useful to the communities that need them most. Finally, rural communities need their own models of working together regionally. With long distances and meandering topography between locales, regular gatherings between neighboring communities can be difficult, but finding ways to collaborate rather than compete is a great way to pool clout and resources for mutual benefit. On the opposite end of the rural-urban spectrum, Damien Giudici (self-employed, Perth, AU) and Daniel Hilhorst (Deputy Marketing Manager, Pogo CarShare, Edmonton, AB) explored a session on “innovation hubs,” places that encourage innovative activity through a hyper-concentrated mix of working and social uses. Panelist Steve Davies of PPS demonstrated how many examples have bubbled up organically at the grassroots over the years, in arts and culture clusters like 401 Richmond St W in Toronto or public markets like Pike Place in Seattle, while Jennifer Vey of the Brookings Institution explained how the rise of new kinds of hubs—like incubators, accelerators, and broader innovation districts—reflects an increasingly sophisticated and intentional attempt to encourage innovation through placemaking. 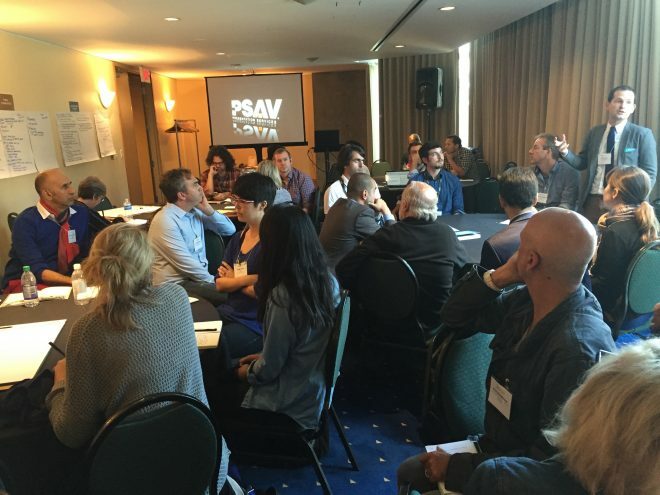 The session featured many exciting examples of such hubs, including new efforts on Vancouver’s Granville Island. However, Hilhorst called attention to the gap in some locations between their remarkable sense of place and their willingness to embrace innovative uses and technologies, on the one hand, and the lack of attention to the public realm in some innovation districts and hubs, on the other. But according to Guidici, panelist Ed Blakeley raised the most provocative question of the session: How can we democratize innovation? The relocation of a major corporation back downtown does not guarantee that it will benefit the community around it. How can placemaking programs and policies come together to ensure that innovation is economically, physically and socially accessible to everyone? PLF Participants brainstorm key issues and new strategies in placemaking. Participants in the transportation breakout got right to work identifying the actions that they could take as a group. As PPS’s Gary Toth reported, much like rural placemaking, this agenda still requires a better library of resources for people to make their case to decision-makers: shareable PowerPoint slides, one-page briefs, best practices, case studies and war stories, metrics and statistics. In particular, the economic argument for streets as places needs to be gathered and communicated more effectively. Finally, the group agreed that aligning messaging between like-minded organizations and movements will help strengthen the case for streets as places. While the placemaking movement has much in common with New Urbanists and Smart Growth advocates, we don’t always come together to promote our common causes. Since we're all "pushing the same wagon," how can we reach out to our allies and coordinate our efforts? Participants in the arts-based placemaking session discussed how creative placemaking projects can use metrics to move beyond the usual activations of public space and create more meaningful, playful, and inspiring places. Since creative placemaking projects can have a strong impact on the social, cultural and economic life of communities, in order for them to serve and represent the actual communities in which they exist, it is important to decide what we truly want to achieve with creative public space projects far in advance of the implementation stage. Vorderbruggen also suggested that some of the most interesting ways we can measure these impacts are visual methods. Time-lapse photography and video can collect data on visitor patterns, and in conjunction with conducting surveys at various times of the day, these methods can help us understand, for example, whether visitors are tourists or locals, whether the project is fostering social interactions between strangers and so on. Vorderbruggen emphasized the importance of engaging the community in deciding the units of change, as people will have varying opinions about what to measure and why. For example, platforms like social media might be a useful tool for collecting data on a certain group of visitors, but useless for capturing information on those who do not use this technology. Equally, important measures of change might vary depending on the project, for example, did the project help create a reduction in crime or alter the perception of safety within the space? Did the visitor spend money while they were there? Did they walk there? It is crucial to think about the entire context of the project. "One size doesn't fit all," as Vorderbruggen put it. "Different projects may require different measurements." A major concern for participants in the health breakout session was how we can define “health” and “place” through a lens of equity and inclusion. It is no surprise that health challenges faced by those living in disadvantaged neighborhoods—places that struggle with persistent and systemic problems like unemployment and poverty—reflect the growing statistical gulf of health inequities between the wealthy and poor. Creating places that not only focus on health, but that are also inclusive, is a major challenge. As PPS’s Laura Torchio reported, communication, and especially communicating to the right people, is crucial to improving the relationship between health and place. Torchio explained that there is an abundance of excellent resources on how to build and shape healthier places, but organizing the resources, creating a common language, and making them accessible to people is the missing link. Utilizing case studies and research can help communicate useful and practical information not only to communities, but also to those who can help move policy agendas at various levels. The group also suggested that placemaking should be linked to efforts to end the cycle of community trauma, like safe injection sites, for example, and bring more health providers to the table. Bringing community members and stakeholders together to shape a place can have powerful social benefits that in turn connect to positive health outcomes. Whether that is something as simple as helping maintain sidewalks or as large-scale as building a new recreational facility, these can all have a positive impact on a community’s health. Underneath every placemaking effort is a broader question of governance. As André Leroux (Executive Director, MA Smart Growth Alliance) reported, the simple question of ownership of public space raises issues of responsibility and accountability for getting things done. Who is really in charge of the place? New models of management and financing like community benefit districts are challenging the idea that public space should always be government-owned and -operated, as well as the fear that devolving control necessarily means privatization by a corporation or any one powerful party. As Peter Smith demonstrated in Adelaide, Australia, “Lighter Quicker Cheaper” interventions can also be the seeds of a broader place governance agenda, though more structural changes are need as well. Reframing government departments around place can help bust the disciplinary silos of municipal government that keep the left hand from knowing what the right is up to. However, these shifting models of governance also come with their own pitfalls. For one thing, they demand that placemakers examine the new structures of power and privilege they create. Who is the community that benefits? Who isn’t at the table? Place governance also raises the specter of whether the placemaking movement is becoming “institutionalized,” and if it is, the necessity that we guard against the tendency to replace old gatekeepers with new ones.